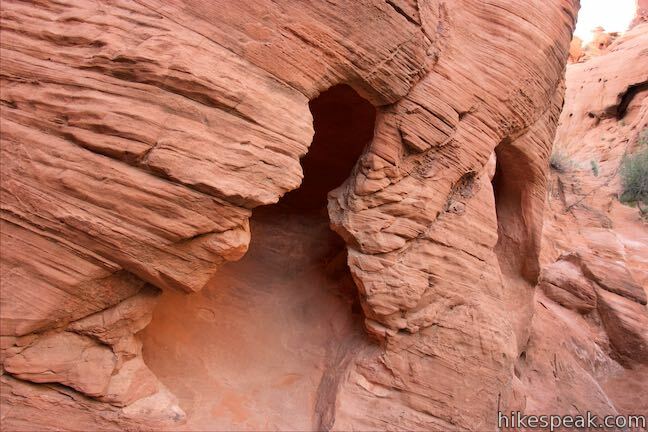 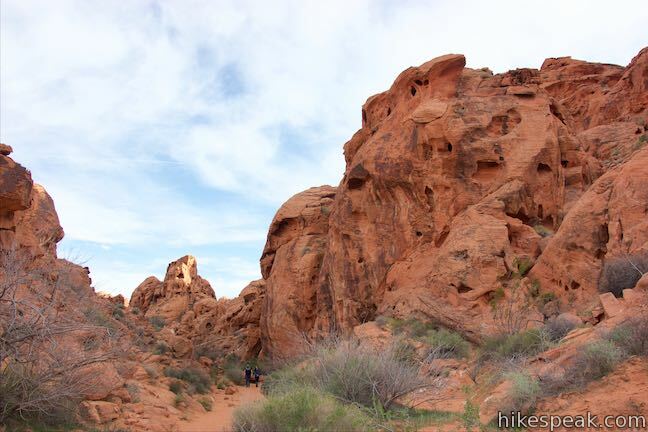 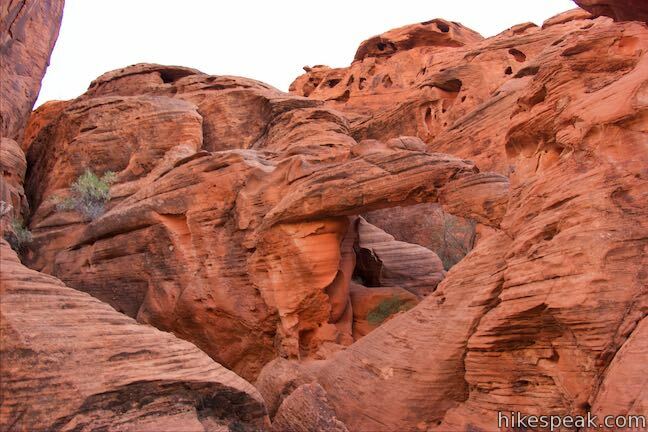 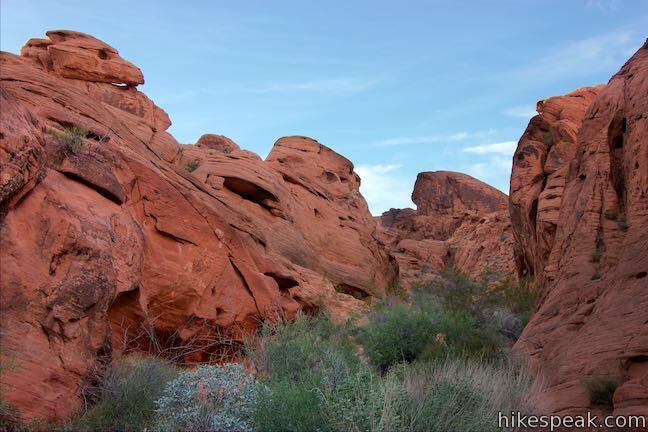 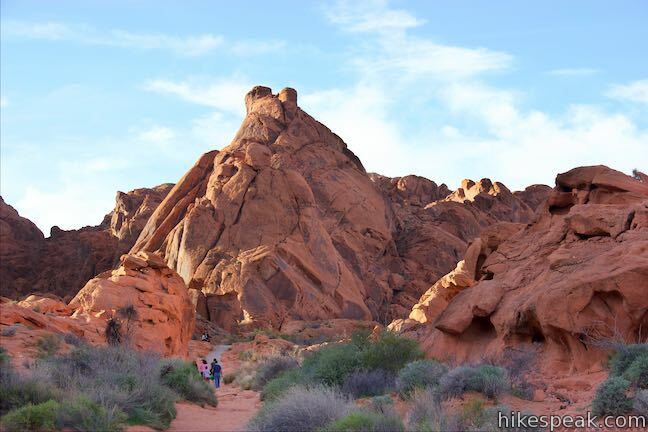 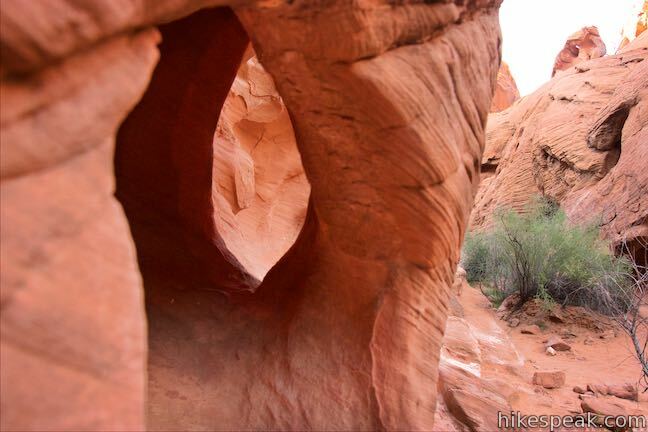 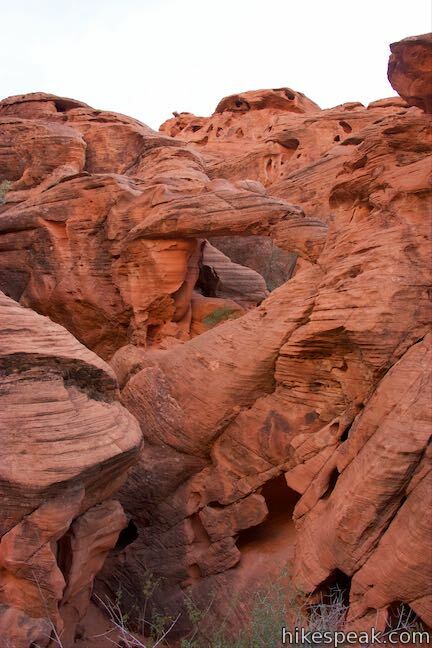 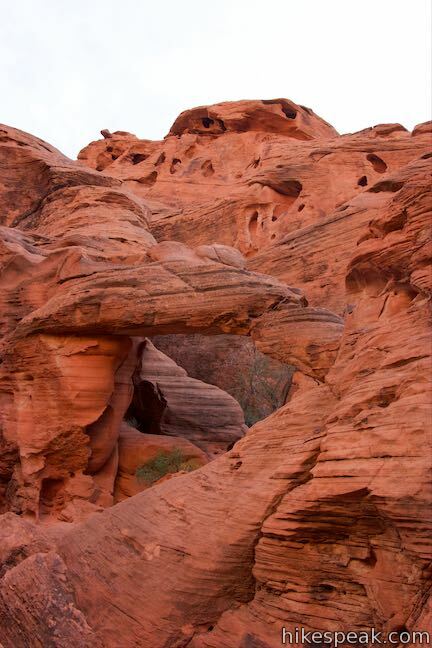 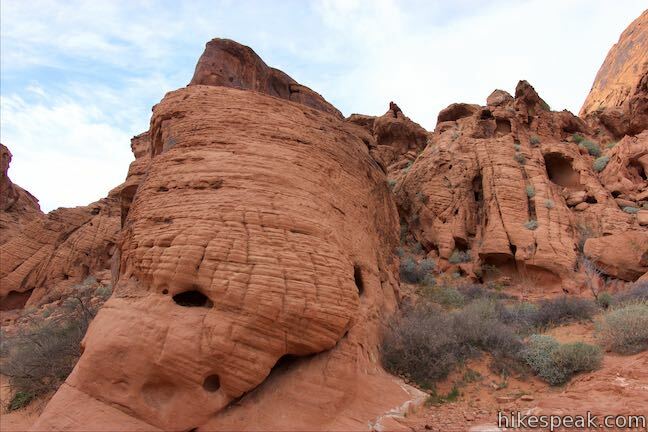 The best outing for seeing petroglyphs in Valley of Fire State Park is Petroglyph Canyon Trail. 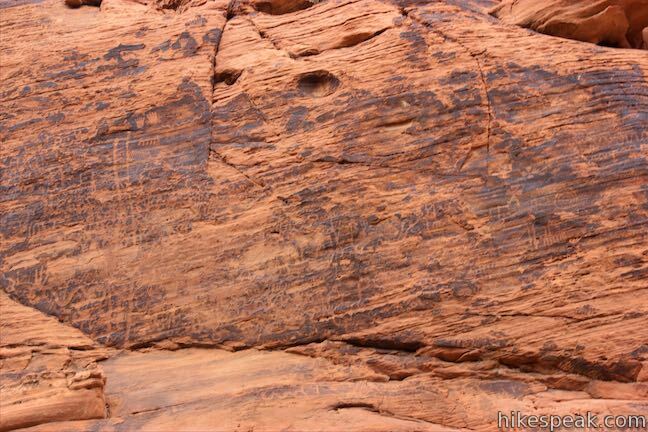 This 0.75-mile round trip hike passes rock faces that are covered in Native American rock art. 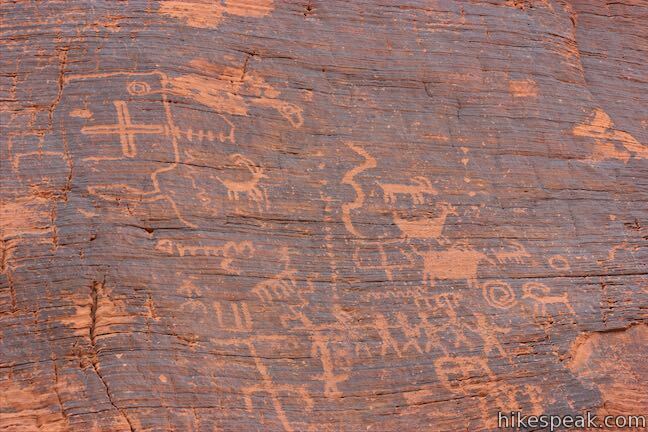 The abundance of prehistoric petroglyphs on this trail is amazing. 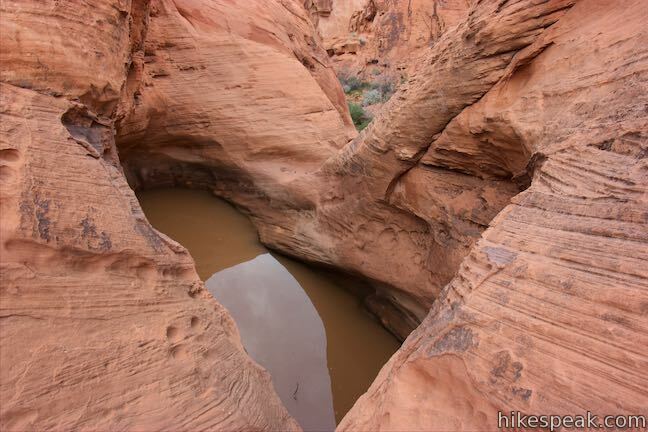 To cap things off, the trail ends at Mouse’s Tank, a natural basin (or tinaja) of water suspended in sandstone. 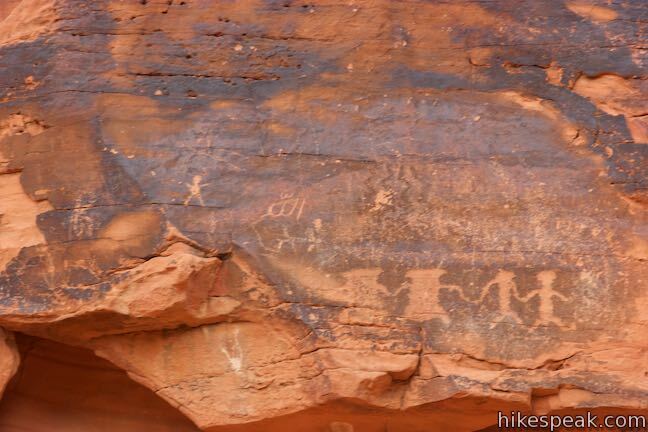 Mouse’s Tank is a nice prize at the end of this short hike that rewards hikers with an incredible amount of petroglyphs. 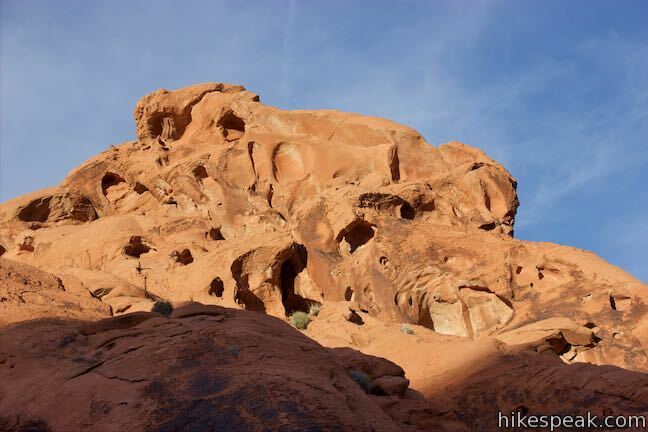 Petroglyph Canyon Trail begins off White Domes Road (also called Mouse’s Tank Road) about a mile up from the park visitor center. 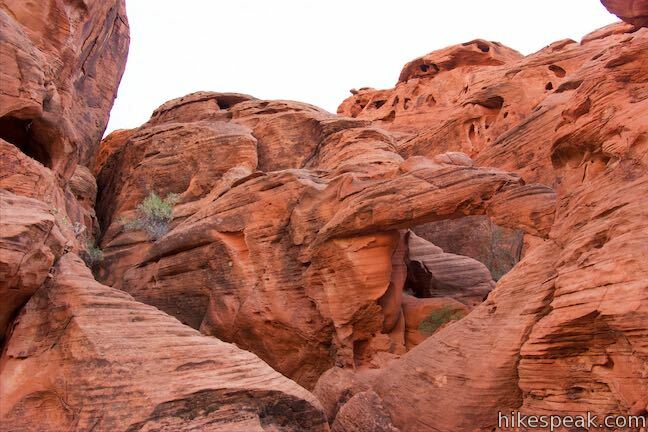 A picnic area among the red sandstone formations on the opposite side of the road is one of the nice places to sit down for lunch in Valley of Fire State Park. 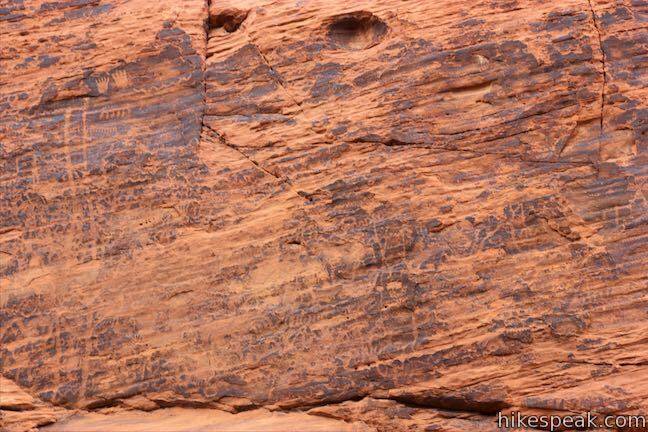 A sign at the start shows examples of the rock-carved symbols that you might see, accompanied by potential translations. 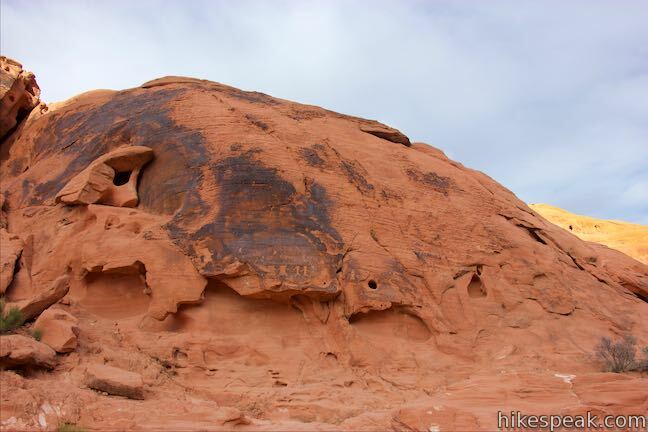 Set out southeast on Petroglyph Canyon Trail, hiking along the bottom of the sandy wash with formations of red sandstone on both sides. 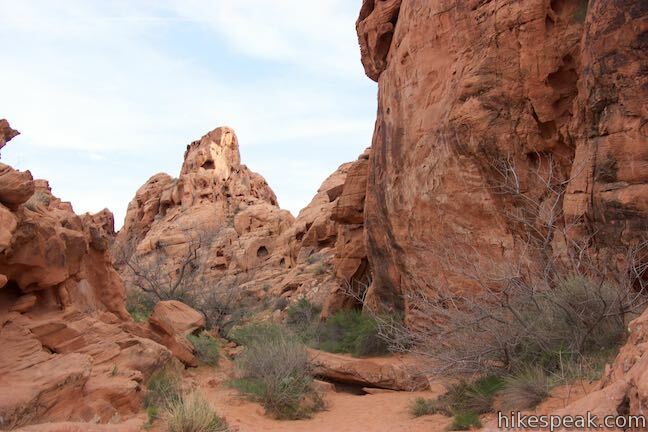 The park asks hikers to stay in the wash and not climb on the surrounding rocks, which are fragile. 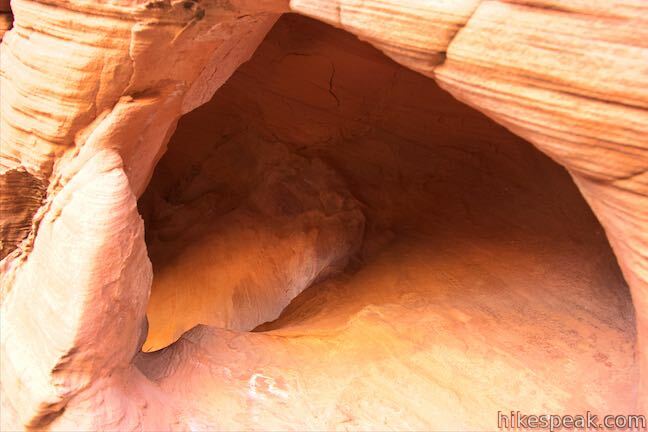 Traveling off trail can destroy artifacts left behind by the Native Americans who spent time in this canyon a few thousand years ago. 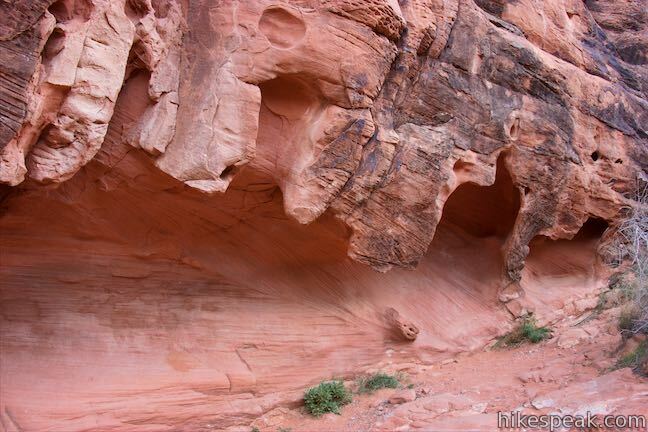 Do your part to make sure this doesn’t happen! 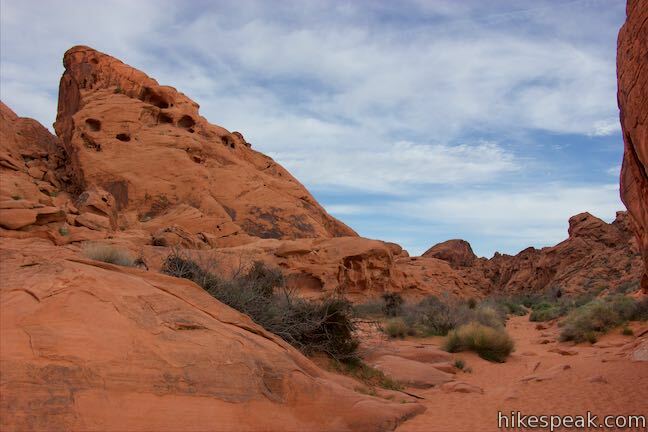 After just 1/8 of a mile, you’ll see the first obvious group of petroglyphs on the left (north) side of the trail. 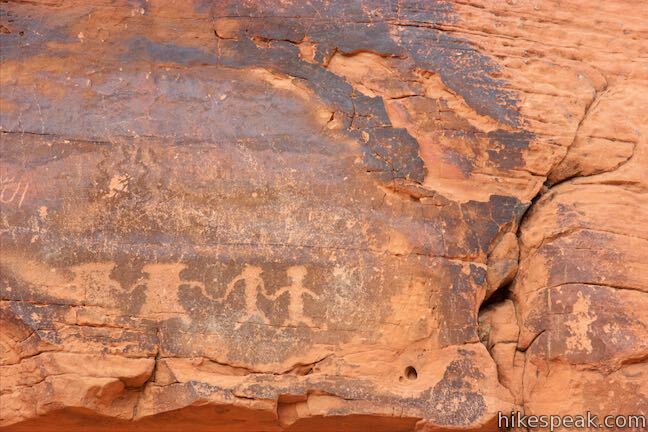 This rock carving looks like four people holding hands. 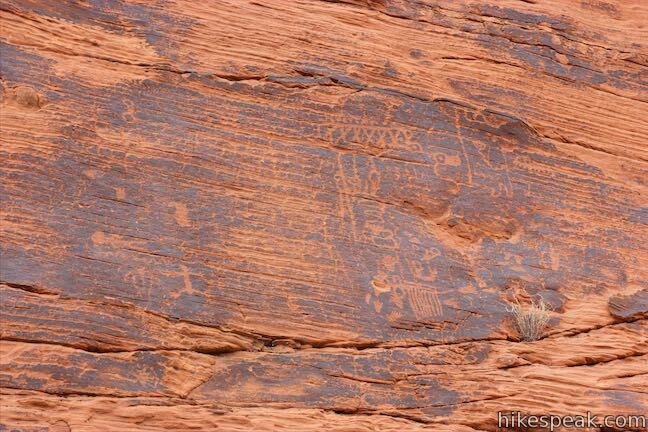 The petroglyphs were etched into desert varnish, a layer of dark rock on top of the sandstone. 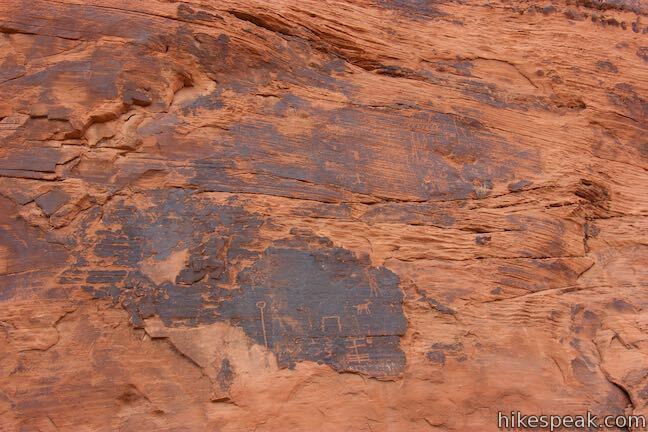 With the black layer carved away, the petroglyphs reveal the orange rock underneath. 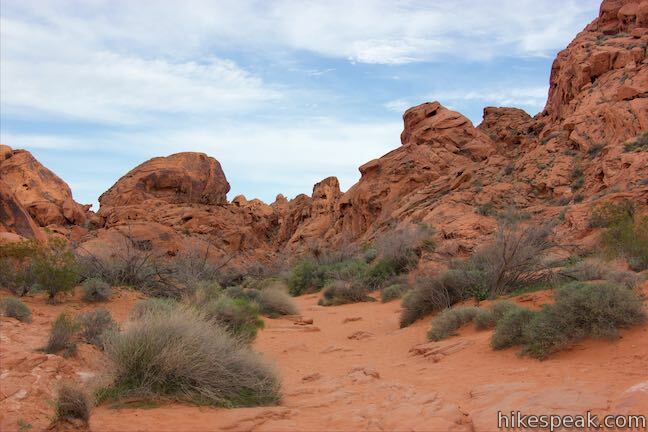 The desert varnish is a patina of iron and manganese that leached from the rock and evaporated over the course of thousands of years. 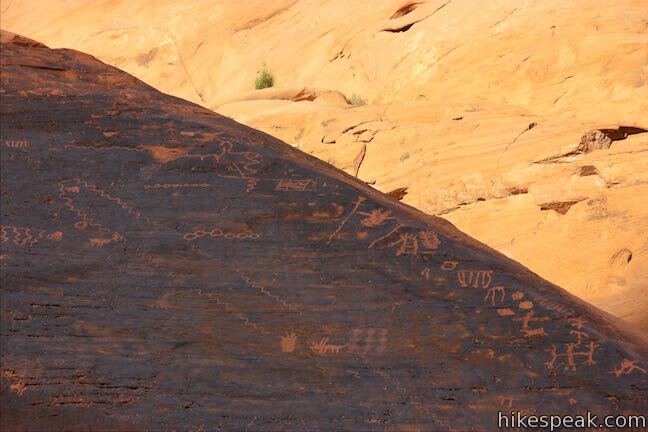 Ancient Native Americans used flat surfaces of desert varnish as their canvases for rock art, so pay attention to these areas along the trail. 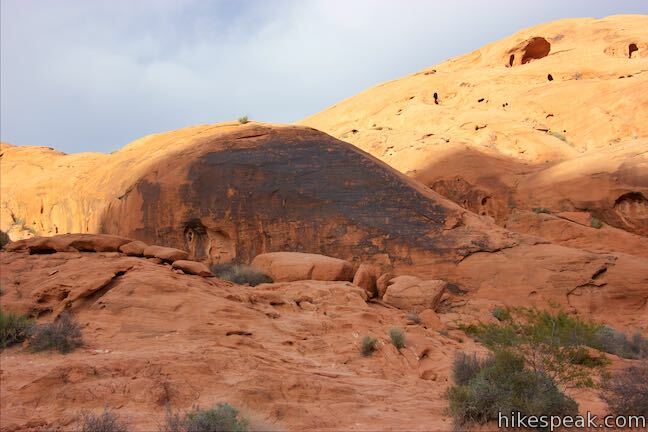 Walk a short distance and you will come to another area of petroglyphs on a tar-colored boulder set back from the trail, also on the left. 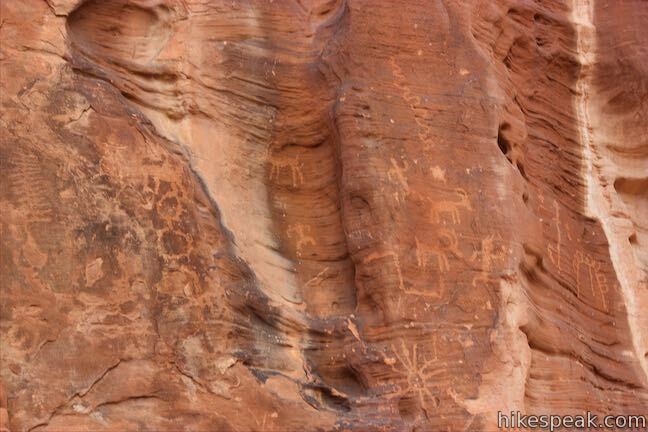 This is the largest grouping of petroglyphs on the hike with numerous figures, animals, and symbols etched into the rock. 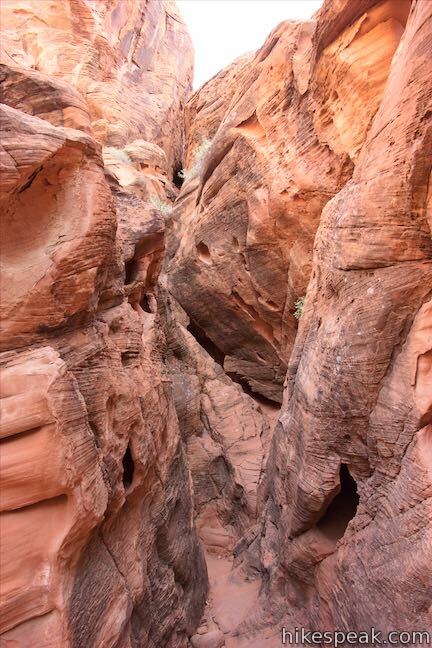 Proceed down the sandy wash. You won’t be able to take too many steps before spotting even more petroglyphs on the dark surfaces on the north side of the canyon. 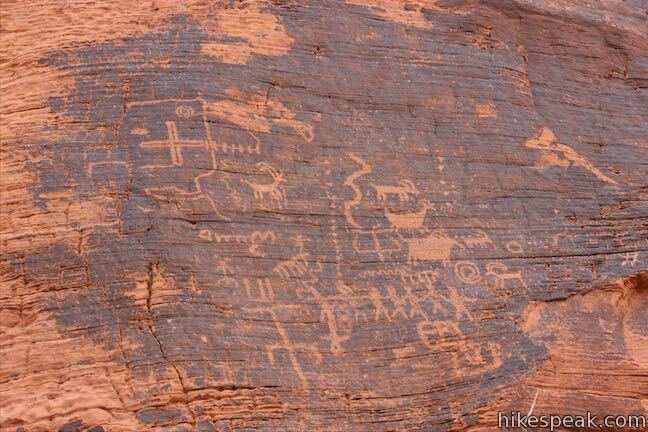 A third area of petroglyphs comes 0.2 miles from the start and there are a few more after that. 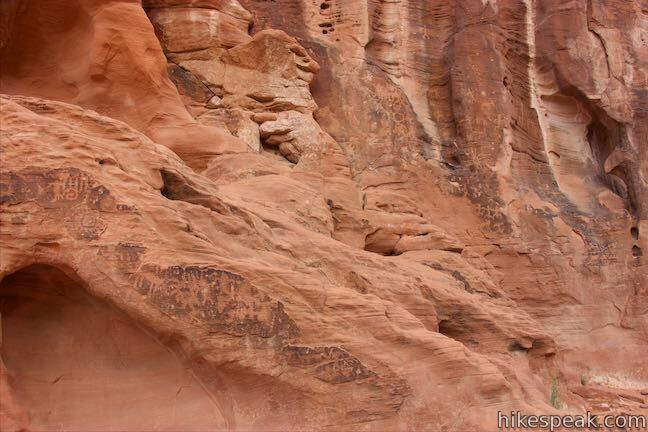 The terrain widens temporarily and then the sandstone formations framing the trail push together. 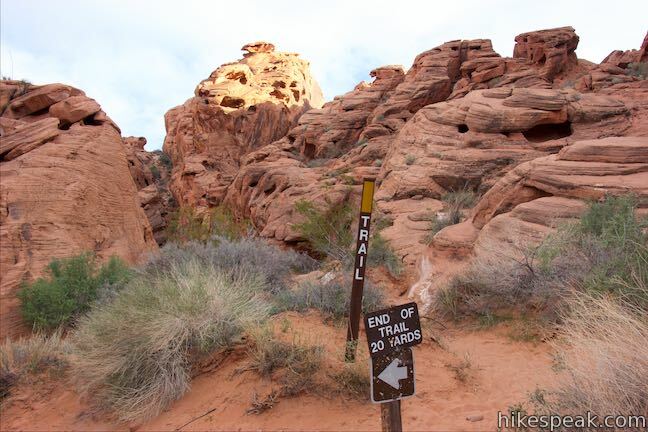 After 0.35 miles of hiking, come to a sign directing you to turn left to reach the end of the trail. 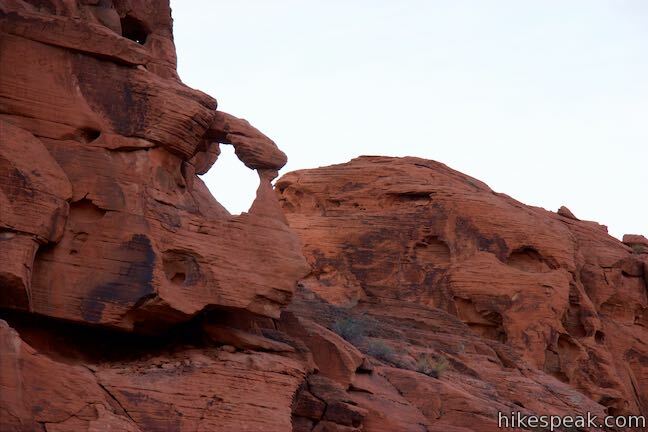 Take this left to get to Mouse’s Tank. 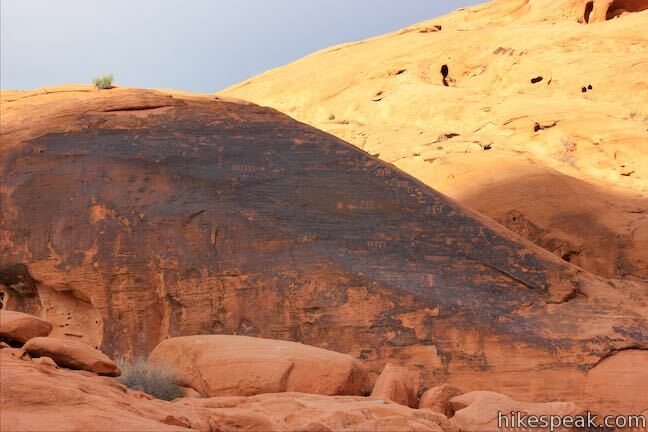 Walk the final 20 yards to the top of a pour over with smooth sandstone ledges containing a tub of water. 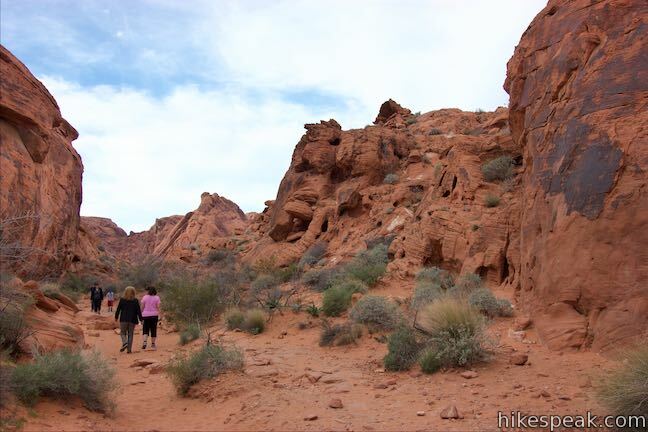 The tinaja is not suitable for drinking, but you can imagine how it would have been useful for Native Americans traveling through the area. 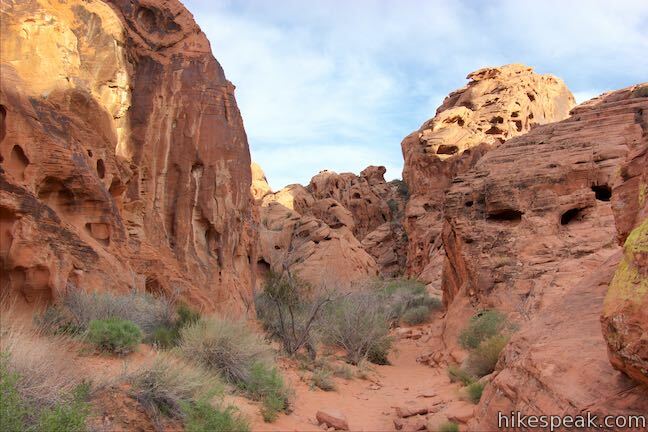 Mouse’s Tank is named for a renegade Southern Paiute Indian who gave other Indians and settlers in this region great trouble during the 1890s. 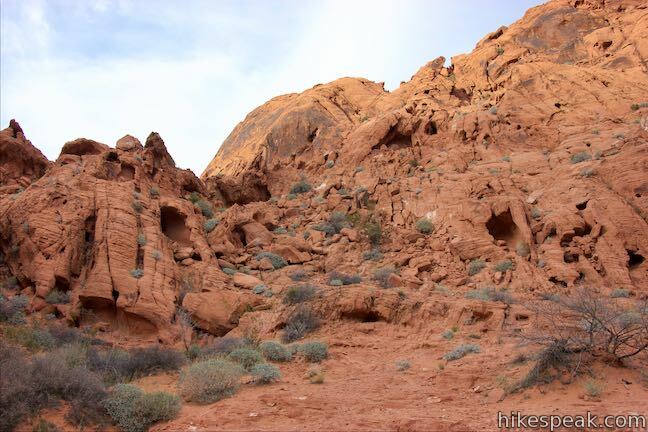 One of his favorite hideouts was this wild and inaccessible canyon. 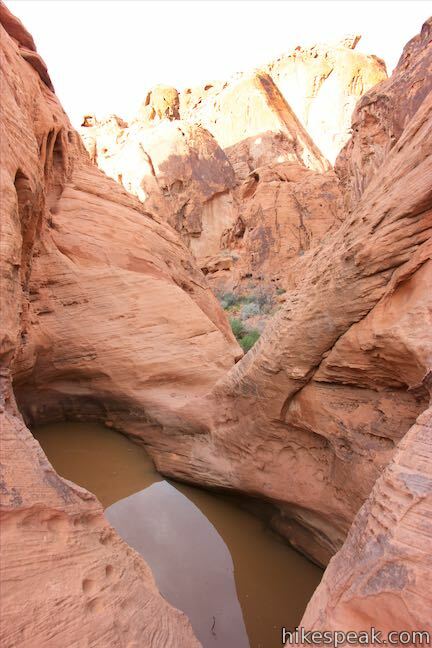 The “tank” is a stream-worn basin hidden among the rocks that traps and holds precious water during long dry periods. 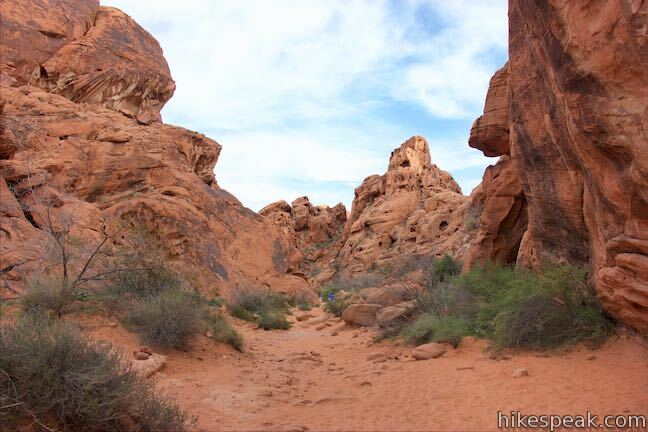 Leave Mouse’s Tank and hike back the way you came for a 0.75-mile hike. 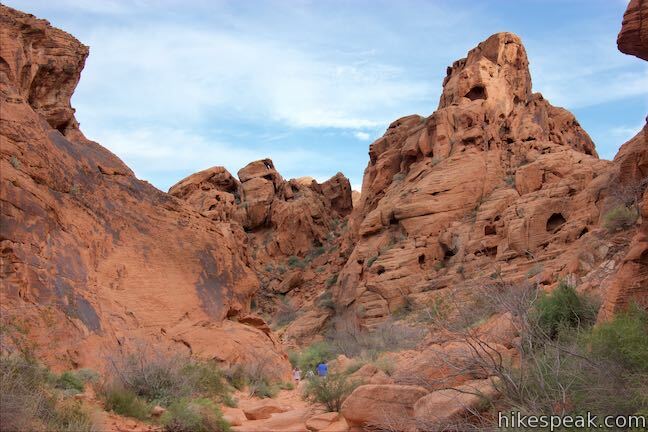 If, at the sign that directed you to turn left toward Mouse’s Tank, you continue straight up the branch of the canyon that you were hiking on, you can follow a path for a hundred yards to the back of the canyon. 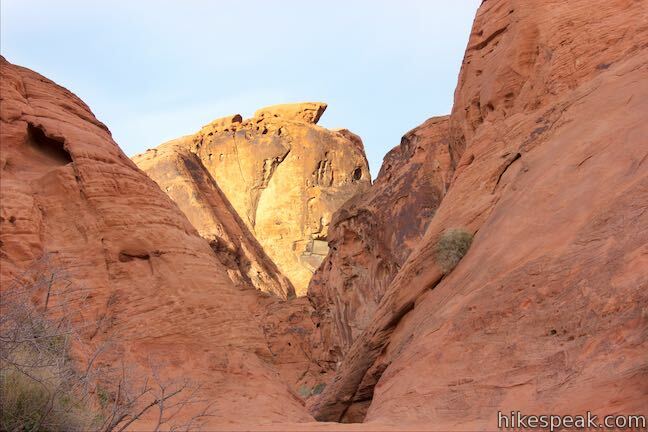 At that point, if you look to your right, you will see a short, narrow box canyon. 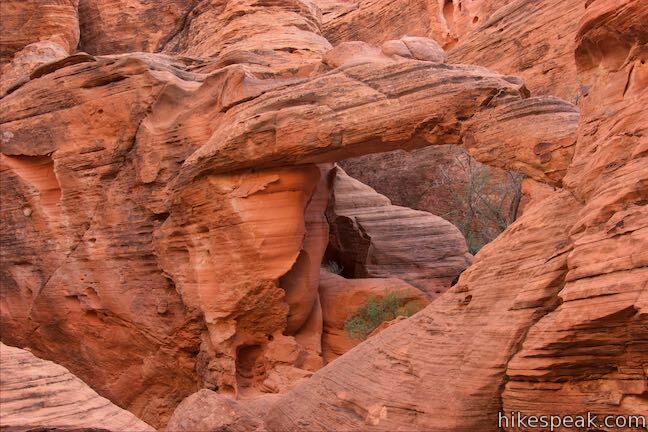 Above that, a natural arch spans one line of rock. 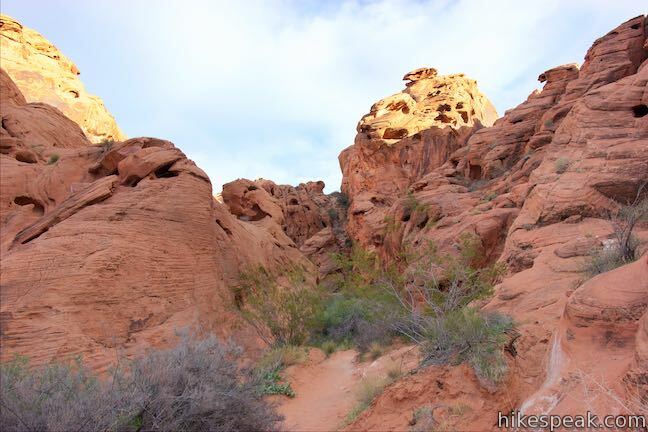 This unofficial little spur makes a nice bonus off Petroglyph Canyon Trail, but you could also just hike straight back from Mouse’s Tank and be totally satisfied. 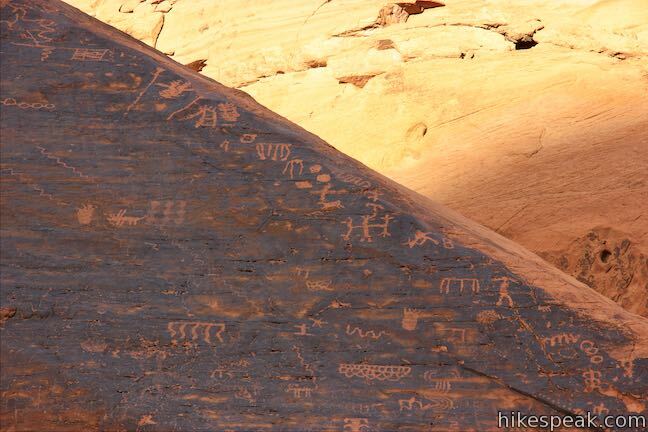 The amount of rock art along Petroglyph Canyon Trail is really extraordinary. 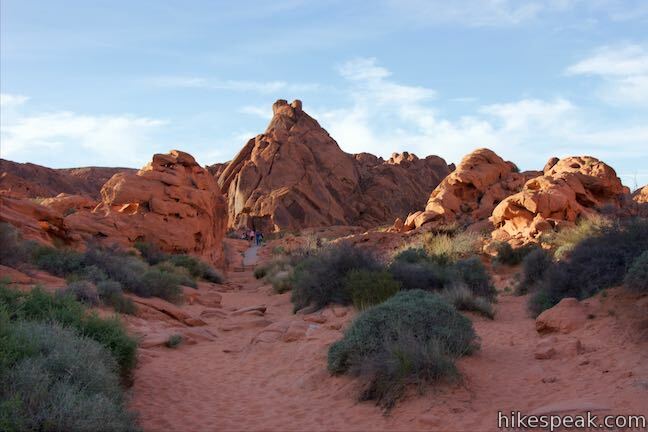 Valley of Fire State Park charges an entrance fee, but no permit is required to hike to Mouse’s Tank via Petroglyph Canyon Trail. 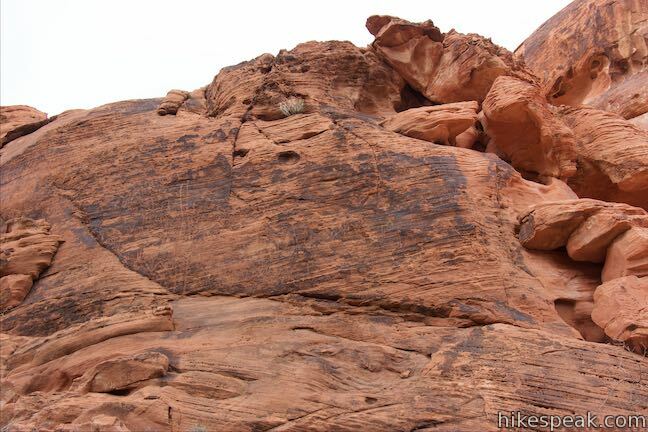 Leashed dogs are allowed. 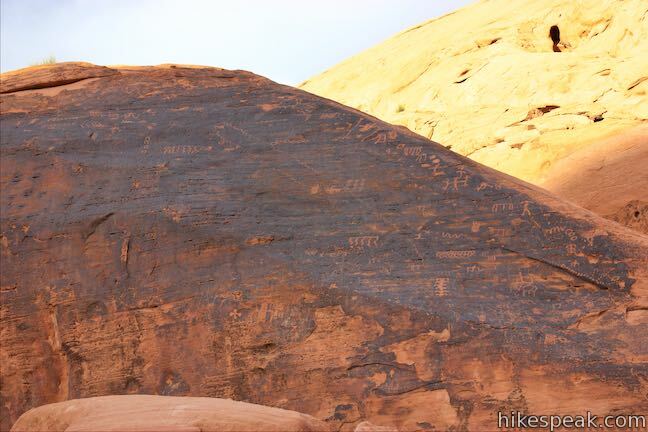 Please report vandalism and do not do anything to damage the petroglyphs. 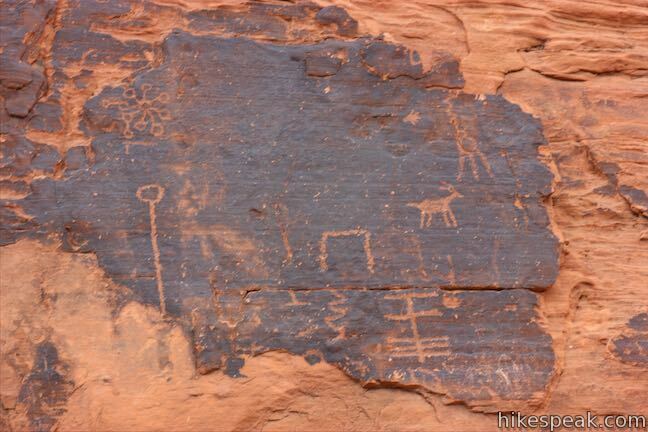 To see more petroglyphs in the park, check out Atlatl Rock. 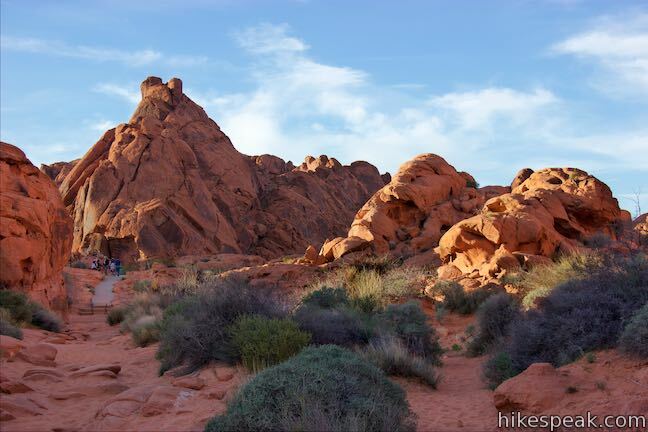 To get to the trailhead: From Las Vegas, take Interstate 15 north for about 35 miles to exit 75 (signs for Valley of Fire State Park and Lake Mead National Recreation Area). 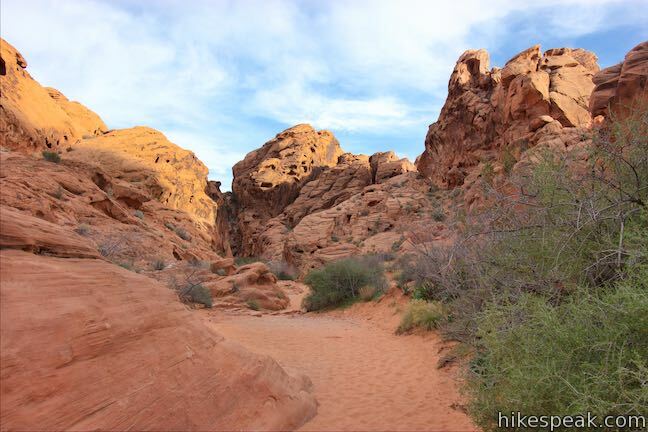 At the end of the offramp, go southeast on Valley of Fire Highway. 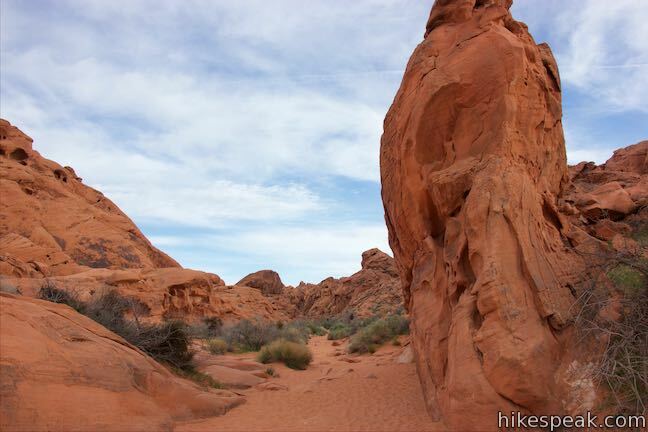 Reach the park’s west entrance after 14.5 miles. 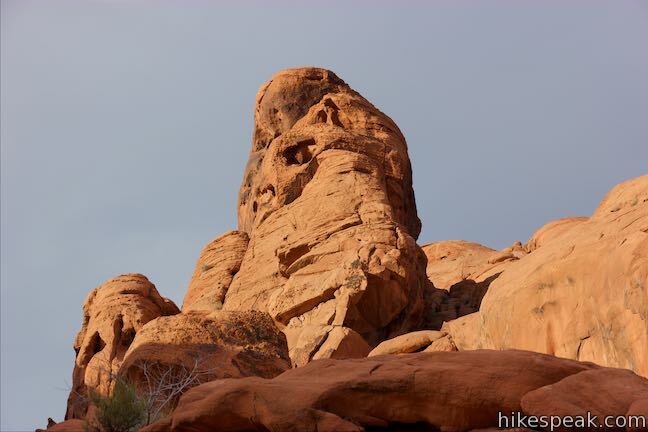 Drive another 3.5 miles and turn left, following a sign for the visitor center and Mouse’s Tank. 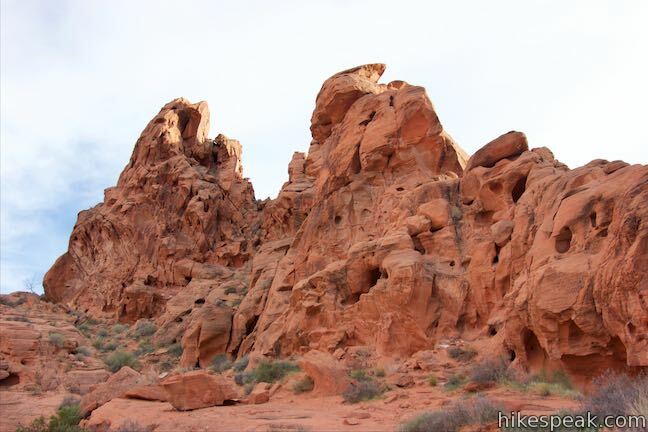 Go a tenth of a mile and bear left to stay on White Domes Road, bypassing the visitor center. 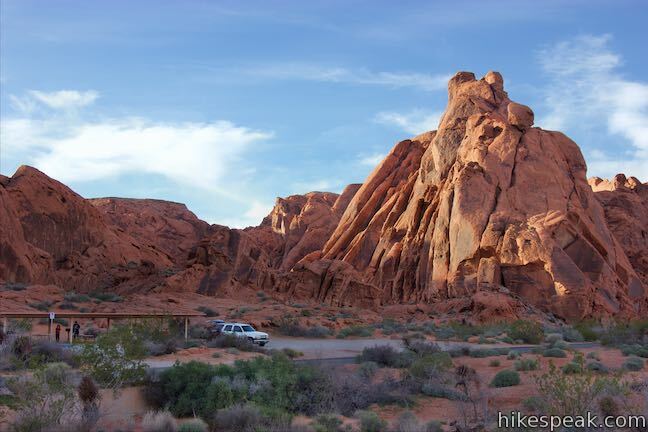 Drive another 1.1 miles to the first trailhead on the right. 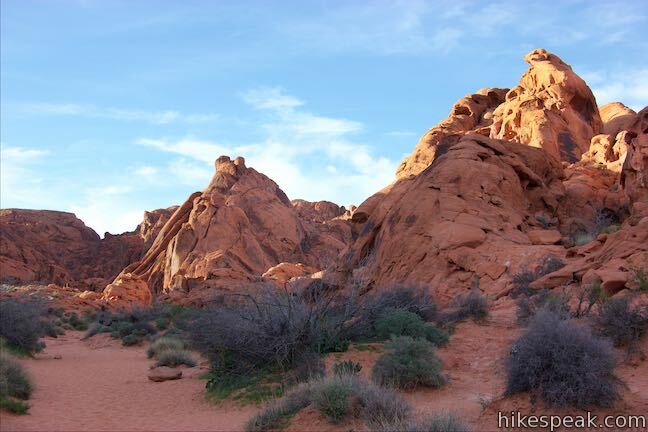 Arriving from the east, from the intersection of Route 169 and 167 near Lake Mead, drive west on Valley of Fire Highway for two miles to the park’s east entrance. 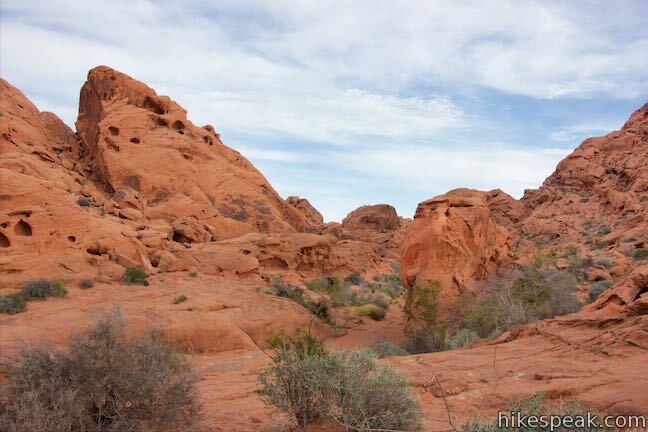 Drive another 3.3 miles to the intersection by the start of White Domes Road, turn right and take this road for 1.2 miles to the parking area at the start of Petroglyph Canyon Trail.